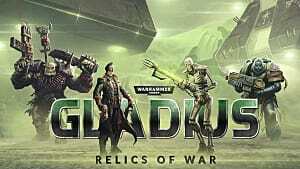 After getting to try out a limited alpha with just one faction, we've finally gotten our emperor-worshiping hands on the final release version of Warhammer 40,000: Gladius - Relics Of War. In the darkness of the far future there is only war, and Gladius offers that up with grim abandon in an extremely satisfying turn-based format that simplifies the 4X style into a full-on combat game. As a franchise known for RTS, FPS, and mobile titles, going 4X is a nice twist, and one that works better than you'd think. The eXplore and eXterminate sides are easily the most heavily showcased, but there's plenty of resource gathering, city building, and technology researching going on as well. 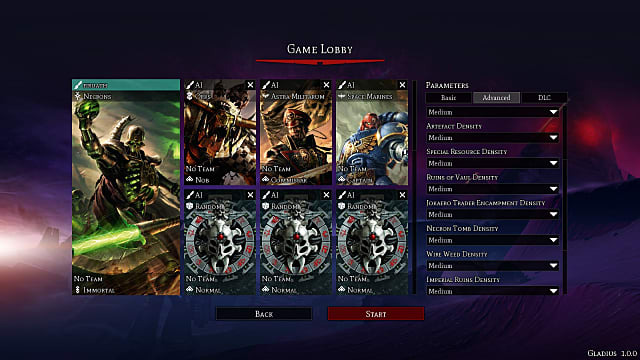 Somewhat like Dark Crusade and Soulstorm, this is a game that's more about the mechanics than the backing story, with tons of options in terms of map size and features to choose for a variety of matches. Battles can balloon into huge engagements that get out of control very quickly, with death bots, heretic tech priests, guardsmen, Kroot hounds, enslavers, Orks, and Necron soldiers all annihilating one another in a small space. Playing around with the map options here can result in some ludicrous (and kinda awesome) matchups, like adding 10 extra AI players into a small map. At one point I actually crashed the game by adding too many starting factions, so there's an instance of the indie nature of the game that needs to be addressed with a day 1 patch. This ended up being more "planetary genocide" than "war"
Although there are unique quests for each faction, the early game will be quite similar for all four as you start acquiring tiles, battling Kroot hounds, and avoiding those giant killer robots. 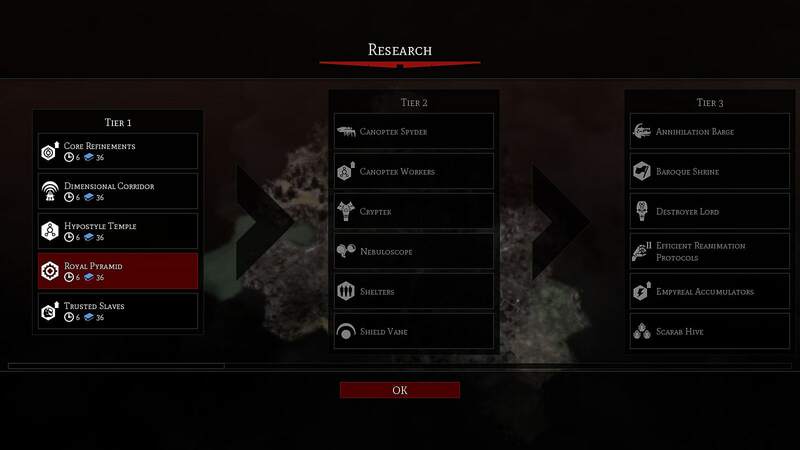 Where the game's main differences truly show up are in the playstyle between the factions and their research trees. 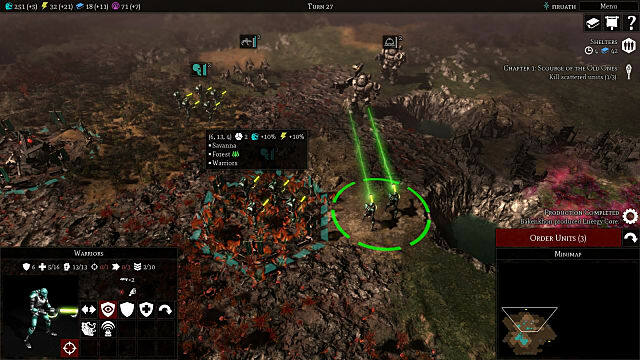 A wide range of unit types and vehicles are available for each faction, with more combat stats and options than in your typical 4X game. Space Marines for instance only have one main city with smaller hubs, while Necrons can build entnirely new cities on tombs to spread like a plague. Those metallic deathless warriors also have a huge advantage if you keep your resources up at all times -- the ability to institute Rapid Rise to get units out faster. Orks expand and gain resources directly through fighting more than building, while the squishy Astra Militarum are large in number and have indiscriminate long range power but are much weaker on other fronts. That's the faction to pick if you want a challenge and need to try the game from a totally different view point. Gladius isn't a perfect game, and there are some downsides, noticeably with the graphics that are a little cartoonish and rough. Models like the Kroot hounds seem particularly lo-res. For some this will be a bigger deal, but it actually reminds me a bit of the classic turn based 40K games from an earlier age of PC gaming and provided a bit of nostalgia. 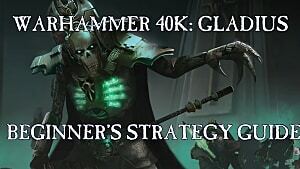 As mentioned before, there's not much of a story going on, just basic objectives for each faction to try to take control of the planet, but that's essentially to be expected of 40K games at this point. 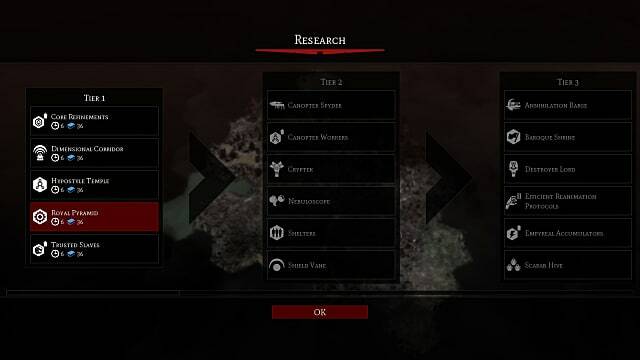 There are also limited factions for a strategy game, although it seems like Chaos must be coming down the line as an entry for the Lord Of Skulls DLC appears in the map options. Finally, there's no diplomacy at all, but frankly it wouldn't make sense in the game universe. This is 4X stripped down to its combat, exploratory form, as it should be for a game set in the grim darkness of the 41st millennium. Of all the Games Workshop-licensed games that have arrived lately, this is the one that I could foresee actually playing the most despite the handful of flaws. The game is fairly complex but without the massive learning curve of Total War, and much more consistently satisfying than the unpolished FPS experience that was Space Hulk: Deathwing. Even if you have absolutely no experience with this genre, anyone who loved the earlier Dawn Of War games will feel at home here with a lot of the mechanics and terminology. For what is clearly an indie game, Gladius absolutely delivers, and all Warhammer fans should be picking this one up at the earliest possibility.